Technical SEO is daunting, we know, but we're going to make it easier for you. Mention subjects like robots.txt, crawlability and rel=“canonical” and most people will turn and run away. However, we also know it’s incredibly important. If your site is not technically up to scratch, Google can’t read it correctly, and this will lead to less than stellar rankings - or no rankings at all. 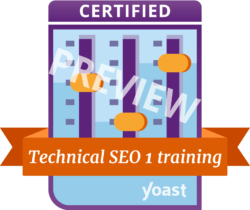 If you need to work on your technical skills, you’ve found the holy grail: the Yoast Technical SEO training. There are loads of aspects that determine how well a site ranks, but we could break it down to this: content, user experience, and technical implementation. While good content and a flawless user experience are a necessity, everything has to be built on a rock-solid foundation. The technical part of SEO is a lot harder to get right and easy to mess up. Think about it; do you know the correct way to block search engines from indexing specific pages? Or what you can do to enhance the loading speed of your site? How crawl budget influences how spiders access your site? To overcome your fear of the technical part of SEO, we are now offering this Technical SEO training. You'll learn just exactly how everything works under the hood, plus you’ll discern how to circumvent common problems. Featuring six comprehensive, but easy to follow modules, with expertly produced video’s, all-encompassing articles and interactive quizzes, you’ll get to the bottom of technical SEO in no-time. Your new-found knowledge will be instantly applicable to your site or situation. After this course, you’ll have a solid understanding of several main components of technical SEO. In this first Technical SEO training, we’re mainly focusing on the crawlability of your site and site wide SEO. You’ll know exactly how Google functions and how you can bring your site in tip-top shape so the search engine can render and index it without fault. Among other things, you’ll learn all about topics like robots.txt, HTTP headers, site wide crawlability, blocked content, canonical URLs, image optimization and other ways to improve site speed. It all starts with an overview of how search engines like Google work and how we at Yoast practice holistic SEO. You’ll find out what crawlability means and how this impacts your site and rankings. The goal is to make sure that all of your valuable content is readable for Google so it can index it correctly. In this module, you’ll find out what the different protocols, like HTTP, HTTP2 and HTTPS encompass. Joost will also show you what exactly happens when a browser requests a particular site. To round things off, you’ll also discover what HTTP headers and HTTP status codes do and how you can use these to determine issues on your site. 3. What do meta tags do? Module three shows you all about meta tags; these tags give information about the page to search engines. In this substantial section, Joost dives into the source code of a page to talk about different tags that determine what search engines should do. These include robots.txt, rel=“canonical” and meta robots. HTML is one of the building blocks of a site; it determines how a text is structured and should be rendered by a browser. You’ll learn everything about meta tags, to the importance of correct headings, page hierarchy and a lot more. Joost also shows you how to fix errors that prohibit Google to your site. Module five is all about site wide SEO; decisions you make that influence everything on a site. Plus, you’ll find out how to create SEO-friendly URLs and discover what the importance of XML sitemaps is. Last, but not least: site speed. This critical part of technical SEO impacts everything, from how Google indexes and values your page, to how your visitors experience it. Joost shows you how to evaluate and improve your site speed. This course exists of informative videos, quizzes to test your knowledge and background reading. This mixture of learning material provides you with all the necessary skills and tools to set up, improve and maintain your own site’s structure. Read more about our learning methods. Did you complete our Technical SEO training? Great! Make sure everyone knows by showing this awesome badge on your site. On average participants spend 12-16 hours on the Technical SEO training. Depending on your current level of knowledge this might vary a bit. Not sure yet? Take a free lesson! You can take free trial lessons of all our courses. Take one actual course lesson to see whether the training is for you, no strings attached!